The Living Gallery Outpost’s mission is to support emerging artists by creating new and exciting opportunities for them to showcase their work. In line with that goal, we are excited to announce our 2018 Residency Program, which will coincide with The Armory Week. One artist will be selected to use the gallery as their studio for one week. The residency will culminate in an exhibition on the opening day of the Armory Show, March 8, 2018 and a panel of art-world professionals who will provide feedback to the artist on their work and their practice. Visual artists of all mediums are welcome to apply. We are interested in how you plan on using the space in a creative way. Artists can apply from anywhere in the world but The Living Gallery is not responsible for finding housing for non-NYC residents. All applicants must be at least 18 years old. Applications are due by 5 p.m. on Jan. 28, 2018. The winner and semi-finalists will be selected by Feb. 1, 2018. The Living Gallery Outpost opened last August at 246 E. Fourth St. just east of Avenue B. 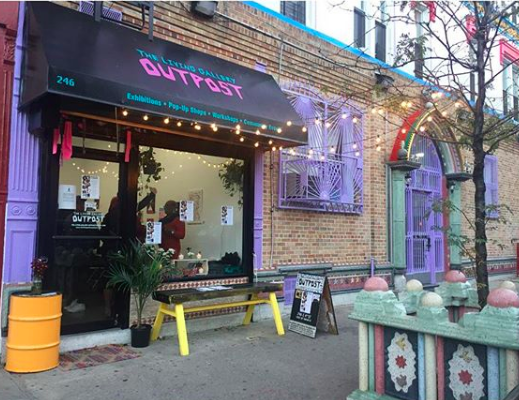 The Outpost is a sister gallery to The Living Gallery in Brooklyn. They're already doing plenty. Thanks for your concern. Perhaps you could volunteer your services? Perhaps a person who is homeless could live there for the residency- in place of art. Perhaps you could volunteer at one of our soup kitchens? Thanks for your concern. Perhaps you, 3:02pm, should provide or help provide a place for the artist to stay.